AUTOMOTIVE NEWS: What's the big idea behind the new GM Marketplace service? What's the long-term potential of those types of relationships?DAN AMMANN: I think it's really about putting the customer in the middle of everything we're doing. If we can make consumers' lives better and more convenient and safer, then that's what it's all about. Given the platform that we have with OnStar and millions of connected cars and 4G LTE, I think there's a lot of opportunity around that. 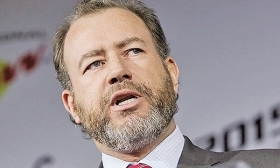 DETROIT — Dan Ammann helped General Motors through bankruptcy as a Wall Street banker. Now, as GM's president, he's leading a transformation of the automaker's global business operations in an effort to prepare it for unprecedented technological change and connect with investors. Along with CEO Mary Barra, Ammann has worked aggressively to reallocate resources from unprofitable or unpromising operations, such as GM's Opel European business, to emerging technologies such as autonomous and electric vehicles, in line with Barra's long-term vision of creating a future with zero crashes, zero emissions and zero congestion. As an industry outsider, the 45-year-old New Zealand native may be the perfect candidate to help move GM to a more service-oriented company that gets it into Wall Street's good graces: He has worked on Wall Street; driven the Nurburgring as a certified industry pool test driver; and is becoming increasingly familiar with Silicon Valley and other centers of innovation. Fresh off trips to Israel and China and, in between, an investor event in San Francisco — where the automaker announced it will launch commercial autonomous vehicles at scale by 2019 — Ammann met in GM's boardroom here with Staff Reporter Michael Wayland, Director of Editorial Operations Dave Versical, Print Editor Richard Johnson, TV Reporter China Haley and News Editor Krishnan M. Anantharaman. Q: What was the response to the investor event? Why focus on autonomous vehicles? A: We believe autonomous technology will change the world in a very, very significant way. It will change the world by having a fundamental impact on safety on our roads. It will change the world in terms of how people spend their time during the day. We can actually create time for people. All this time you spend behind the wheel of your car, we can free that time up for you. It will change the physical landscape of, particularly, our cities and suburban areas. Depending on how you look at it, about a third of space in urban and suburban areas is dedicated to the car through both roads and parking. The key to unlock all of that, and the key to achieve the vision that we've laid out from a General Motors point of view — zero crashes, zero emissions, zero congestion — we believe AV technology is a fundamental key to unlock each of those dimensions. That's why we've been working as hard as we have been on it, and we felt it was the right time to begin to share a little bit of our journey with people. Has GM finally gotten into Wall Street's good graces? Did the San Francisco event help? In addition to this impact that AVs can have on the world, we think there's an enormous business opportunity that comes with this. That's part of why we're approaching it the way we are, part of why rate of change, speed and [being a] first mover are a really important part of what we're doing. As we've begun to share the story with the investment community, I think you've seen a pretty favorable reaction to that and a pretty high level of interest in what we're doing, and I'd say the beginning of an appreciation of the size of the opportunity. CFO Chuck Stevens said the mobility business potentially could eclipse GM's traditional operations. When could that happen? When will mobility create significant revenue for GM? It's too soon to put a timeline on that. The way we think about it is, the first thing we need to do is to get to the point where we can launch safely with scale in a complex environment. All of our effort now is to achieve that objective. That's sort of the beginning point of the journey because one thing that will be different about this technology relative to, say, a human driver is this technology will continue to rapidly improve the more you use it. We think that we can see a path down a cost curve that will make the technology highly compelling and unlock a really, really big market opportunity. The timeline that you asked about will be a function of that rate of development and rate of improvement post-launch. Do you feel GM is leading the industry in this area? I think we have a very clear point of view on what we want the future to look like, and what we need to be able to deliver from a technology point of view to enable that, and that's sort of everything that we're doing right now. Do you think the company is structured the right way to make that change happen at the pace you want? Yeah. I think one of the things we emphasized last week is, we believe on the autonomous front in particular — or autonomous electric vehicles — that we have a unique position right now because we have all of the capability that we need all under one roof, from the software engineering to the ability of building these in scale and all the integration that goes on between those two things. We have a wide capability entirely in our control, which is different, we think, than where anybody else is right now. We know it's much faster to be able to do all this and iterate the entire system in our control rather than have to work across different entities to do that. When did the lightbulb go off for you personally for the potential of autonomous vehicles? Probably the 2015 time frame. We as a leadership team saw the change in consumer behavior, in particular the rapid growth in ride-share and the emergence of those business models. And then there was an increasing level of activity around self-driving, autonomous, electrification and connectivity as four trends for the future. The more we thought about it, the more we saw all this actually converging pretty rapidly, and in particular, the convergence of autonomous technology and transportation as a service or the ride-share, that each one on its own was sort of interesting, but the intersection of them was potentially really interesting because this technology could really unlock that business. Once we came to that point of view that this fundamental change was afoot, we faced the question: What role do we want to play in that? Do we want to observe and sort of follow, or do we want to ignore it, or do we want to actually lead it and shape it? And we concluded that this was the beginning of really major long-term change and that it was really important for our company that we put ourselves in a position where we actually were leading and shaping that future. Has it been difficult to change the mindset of others inside GM? I think there is a huge amount of energy, effort and resources going into the effort. I think the vision that Mary has laid out for the company — zero crashes, zero congestion, zero emissions — is rallying the organization. I think everybody recognizes that between electrification and autonomous, those will be significant keys to unlock that vision. What role will GM dealers have as the company moves toward commercialization of autonomous vehicles? Well, at the moment, we're obviously in the development stage, so it's too soon to comment on that. Have they expressed interest in securing a voice at that table? In general, like most aspects of the automotive supply chain, I think people are looking to the future and, as we all are, try to anticipate what that change means and what different people's role in it will be. What role will GM's global markets play in the vision you're laying out? Are you looking at them as test labs, opportunities for scale or just as generators for the volume and profit you need to fund mobility initiatives? We're in development stage right now. As we look to commercialize and we look to where and how and what order, as I said, we'll think about this as a global opportunity. But it's too soon to be more specific than that. GM has aggressively cut business operations over the last two to three years — India, Indonesia, Russia and culminating with Opel. Is that process done? We have taken, as you've pointed out, a series of pretty significant moves to optimize the business and to make sure that we're allocating our scarce resources — not just financial but engineering and capital and all of our resources — in places that we can win. Part of what that has enabled is the business and financial performance that you see today, which is obviously good. I have a simple operating metric that we like to make a billion dollars a month pretax. That's kind of what we're doing now. A significant part of that is a consequence of the discipline that we've brought to resource allocation and where we're playing and how we're running the business. We have a simple internal thing that everything can be made better, and that's true, and we come to work every day with that mindset. How much of a challenge is it allocating resources between GM's profitable core business and emerging mobility technologies? You've seen us move in a very deliberate way to redirect resources, right? We looked at businesses where we couldn't see a path to long-term success, and we said, we have a choice to keep investing resources in those businesses, or we can find a different solution for those businesses and reinvest those resources where we see more opportunity. It's not so much a challenge as it has been an opportunity, where by taking a much more disciplined approach [in one area], we've not only released resources, but we've driven better performance in the business — back to the $1 billion a month — and that is an enabler for what we're doing [in another area]. It goes hand in hand. GM is on track to gain U.S. market share for the first time since 2011. Do you think that's going to happen? There's still three weeks to go. I don't know. We'll see Jan. 1. We look at market share as sort of an output as opposed to an input. If we do all the right things by the customer — if we invest in the brand, have great product, do all of those things — an output of that will be to grow our share, particularly retail share, which is what we've been focused on. Does GM's plan of participating in markets it feels it can "win" translate to vehicle segments? Should we expect GM to not invest in redesigns for slow-selling models, particularly for cars? As we make the next ongoing rounds of product investment, we're obviously going to make our investments where we see the greatest opportunity. As we think about our portfolio plan, we're obviously observing the trends of what's going on in the market and forming views of where we see that going and making our investment allocations consistent with that.